Today's lunch is brought to you by my homemade chicken gyro. 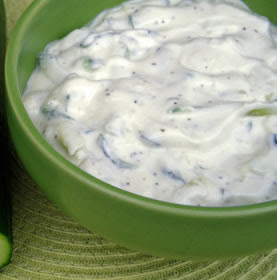 Sponsored by my even more hommade Tzatziki sauce using this recipe from my homegirl Ina. As always I used less lemon than the recipe called for, because I just hate overly lemony things SO much. I highly recommend this for a lunch or dinner. 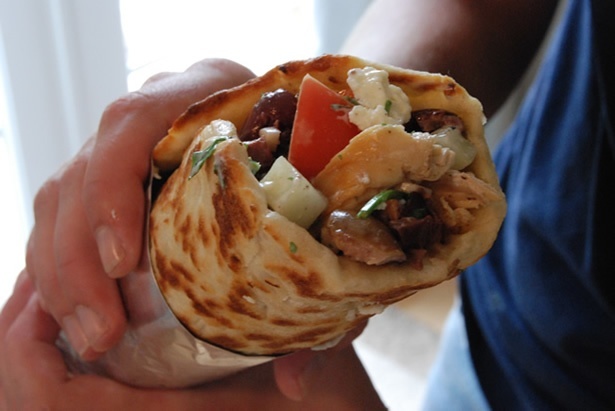 It tastes fresh and delicious, loaded with tomatoes, grilled chicken, feta cheese, tzatziki, and red onions. And the only component that really has an substantial calories is the pita itself. So yum. So Greek. So necessary. I love Chicken Souvlaki!!! How do you season your chicken? I ususally just use Lantana, which is a Texas all-purpose seasoning. But now that you mention it, I bet something more Mediterranean inspired would be a lot better for something like this. What do you use? I love suggestions!